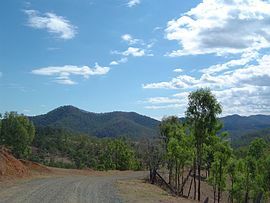 England Creek is a rural locality split between Somerset Region and City of Brisbane, Queensland, Australia. It lies a short distance south-east of Lake Wivenhoe. The locality takes its name from the creek of the same name, being the land surrounding the creek as it flows down to the Brisbane River. The main route through the locality is England Creek Road. ^ "England Creek (Brisbane) (entry 41383)". Queensland Place Names. Queensland Government. Retrieved 7 June 2014. ^ "England Creek (Somerset Region) (entry 44863)". Queensland Place Names. Queensland Government. Retrieved 7 June 2014.